Successfully Added Huawei MediaPad M3 Android Tablet PC - Android 6.0, Octa-Core CPU, 4GB RAM, 2K Display, 5100mAh, Google Play, 8MP Camera to your Shopping Cart. On its breath-taking 8.4-Inch IPS display, this Huawei tablet portraits mind-blowing detail and vivid color. Supporting a mesmerizing 2K resolution, you can be assured that with this little beauty at hand, you’ll be able to enjoy movies, experience games, or simply browse the web like never before. Along with its epic 5100mAh battery that delivers up to 11 hours of continuous usage time, this Android tablet computer packs plenty of juice to get you through the most demanding of days. With Google Play at your disposal, you have access to literally millions of free to download media and applications. Whether you like to watch multiple movies from beginning to end, browse the web, play games, or enjoy the latest mobile applications – with the Huawei MediaPad M3 you’ll never have to feel bored again. Packing the Kirin 950 CPU that has been clocked at 2.3GHz, this powerful Android tablet PC gets through the most intensive tasks with ease. Built for speed and energy efficient usage, this Quad-Core CPU that has been clocked at 2.3GHz is capable of dealing with the latest games and media alike without dropping a frame. Along with its 4GB of RAM, this Android 6.0 tablet furthermore opens up the doors for excessive multitasking sessions – letting you engage in numerous of its amazing features at once without needing to worry about slowing down your device. With 32GB of internal storage and by supporting up to 128GB or external memory – this Huawei MediaPad M3 is guaranteed to pack enough space for you to store all your files and media. Increasing your overall user experience even further is the high-end acoustic technology that this tablet PC holds. Featuring technology from Harman Kardon and AKG, this Huawei tablet is guaranteed to deliver a mind-blowing audiovisual performance. Along with its Android 6.0 operating system, this tablet computer delivers a great overall performance that is guaranteed to meet the likings of everybody out there. Whether you use it for study, business, or fun – it is guaranteed to meet all your mobile media demands. 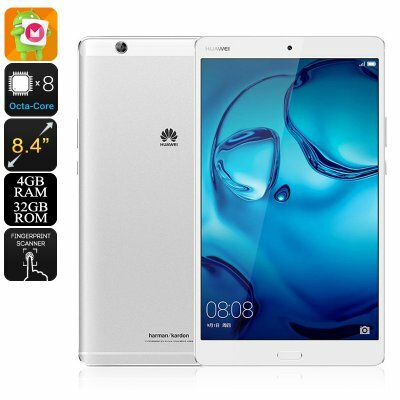 The Huawei MediaPad M3 comes with a 12 months warranty, brought to you by the leader in electronic devices as well as wholesale electronic gadgets..